Russia under Vladimir Putin is falsely accused of malign activities because of the country’s sovereign independence, opposition to Washington’s imperial agenda, its aim for multi-world polarity, and status as the world’s dominant military power, its super-weapons exceeding the Pentagon’s best, developed at a small fraction of the cost. Russiagate witch hunt House, Senate and Mueller probes were a colossal hoax, discovering no US election meddling nor improper or illegal Trump/Russia connection – because there was nothing to find. “Europe’s political stability, social cohesion, economic prosperity and security are more threatened today than at any point since the Cold War (sic) (because) Russia is destabilizing the continent on every front (sic)” – a bald-faced Big Lie. Virtually all establishment media falsely accused Russia of meddling in the US 2016 presidential election to help Trump defeat Hillary – despite no evidence suggesting it because none exists. Last September, it falsely accused Russia of “the most effective foreign interference in an American election in history” – despite nothing of the kind occurring, not in November 2016, earlier, or thereafter. Electoral interference is a US specialty at home and abroad, its dirty hands wanting puppets in power worldwide it controls. One-party rule with two extremist right wings runs America – the War Party, waging it on humanity. 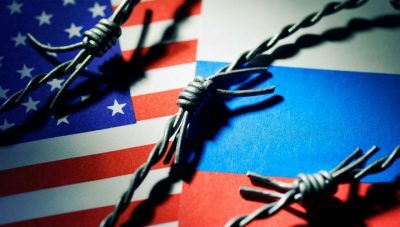 Fact: Russia is the world leader among major powers in seeking diplomatic resolution to ongoing political and hot conflicts – the US the main instigator. Fact: The Russian Federation never attacked or threatened another nation – what the US does repeatedly, waging permanent wars of aggression and other hostile actions on humanity. The evil empire is headquartered in Washington – with branch offices in London, Paris, Berlin, other NATO capitals, Tel Aviv, Tokyo, Seoul, Riyadh, Cairo, Brasilia, Buenos Aires, and numerous other cities worldwide. It’s allied with an array of tinpot despots and fantasy democracies worldwide – notably extremist regimes in NATO countries, Israel, Saudi Arabia, Egypt, Africa, Asia, Latin and Central America. Russia’s influence worldwide is growing, America’s waning. All empires in world history met the same fate, no exceptions.